In Taiwan, there is a word called “Harizu,” which means young people who love Japanese culture such as fashion, music, and anime. This reminds me of Ms. N, who is a Taiwanese woman that loves Japanese culture. After graduating high school, she worked several years to earn the money to study in Japan, which was her goal. She studied and worked part time for two years, and once she acquired the skill of reading and writing in Japanese, she moved back to Taiwan and started working at a company that does business with Japan. I met her through business, so most of the conversations were related to those matters, but her bright and open personality allowed us to engage in talks other than business. When I see her talking about how she loves Japan and its trending music and dramas, I can sense the straightness and passion, and makes me feel happy as a Japanese. Her inquisitive and dynamic personality is also reflected in her love affair, and back then, she was in a long distance relationship with a Japanese man. One day, I received a message from her saying that she will quit her current job. According to her explanation, she married with a man from Hong Kong that she did business with, and to help his business, decided to move to Shenzhen (a city in China located right next to Hong Kong). In Taiwan, marrying at the age of 29 is considered bad luck, and that seems to be one of the reasons why she decided to marry. I felt lonely about the fact that I could no longer do business with her, but at the same time, I felt like supporting her dynamic decision and wishing her a good luck. 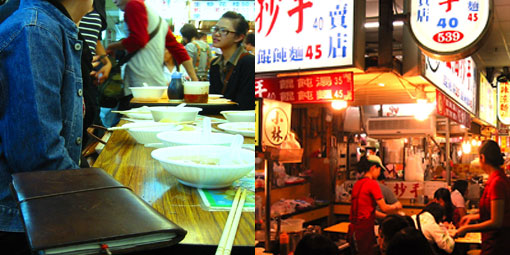 The photo was taken at Shilin night market, which is the largest night market in Taiwan. Ms. N was the one who introduced me to this place. The market is filled with food stands that sell delicious ones at a low price, mysterious ones that require courage when eating, and other various types. There are also shops that sell accessories, clothes, and toys. All these stores are clustered together, and various people are squeezing themselves into the thin street, and walking along. This is a perfect place to feel the power of Taiwan and at the same time, feel the atmosphere of a typical Japanese summer festival. While walking in the night market eating a Taiwanese pancake, I was able to recall my experiences during summer vacation as a child. After a while, I had a chance to meet with Ms. N.
She came to Japan as part of her business trip, and when I tried asking how her husband’s work is turning out, she started explaining her dramatic life in Shenzhen after breaking up with her husband. According to Ms. N, her husband was nice when they were in a relationship, but once they got married, he suddenly started treating her in a cold attitude, and hardly spoke with her. Six months after the marriage, Ms. N divorced with him. This was done based on her ability to make decisions quickly. After the divorce, she stayed in Shenzhen, where she used all her savings to start her own business. By making full use of the experience built in her former husband’s company and her knowledge and personal connections made in her former job, she now runs a trading company as a president that does business with Japan. “I like Japan, and I wanted to make my company have relations with Japan.” I was simply impressed by her action and decisiveness, and the way she said the phrase above naturally. Again, I would like to support her action and wish her a good luck.